WAILUKU » A California man and woman died yesterday after large waves swept across a tidal pool area near Kahakuloa in northern Maui, authorities said. 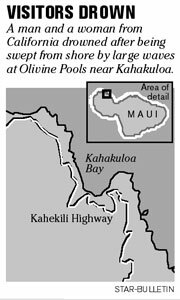 The two were near the ocean's edge in a place known as the "Olivine Pools" near the Bell Stone, Maui Fire Department officials said. The pools are vulnerable to large rogue waves in the fall and winter months, sometimes rising as high as 20 to 30 feet. Fire Battalion Chief Jeff Shaffer said witnesses reported that a large wave swept the man off the rocks and pulled him out to sea. Shaffer said the woman was calling for help when another large wave swept her off the rocks. Fire rescue workers, dispatched at 12:50 p.m. yesterday, were told that the man was lying face down and the woman was treading water in the area about 20 to 30 feet offshore, Shaffer said. A fire rescue helicopter arrived at about 1:15 p.m. and retrieved the man. A watercraft picked up the woman, who was unconscious, Shaffer said. Efforts to revive them were unsuccessful.